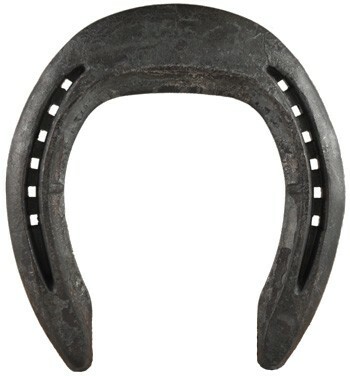 The Centre Fit Performance Hind shoes are specially designed to facilitate many of the needs of today’s performance horses and other horses that work in arena surfaces. The wider toe section allows for less toe-sink in the propulsion phase of the stride. A little extra heel length has been added to support the heel and minimize reverse rotation of the foot into the softer surface upon landing and load. The inner rim of the shoe is raised to allow for less strain on connective tissue around the DIP joint during lateral movements. The toe has a gradual taper that helps minimize strain on the DDFT and Impar Ligament at the time of breakover, yet helps to maintain enough tension to produce a maximum length of stride. And finally, alignment marks on the center of the shoe make it easier to get the shoe properly placed around the widest part of the foot to maintain good D/P balance. More sizes available on request!